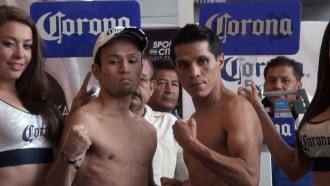 WBC Silver Flyweight champion Edgar Sosa of Mexico (right) and challenger Japan's Shigetaka Ikehara weighed-in 112 lbs (58.800 kgs) en route to their title battle tomorrow night the Centro de Espectáculos de la feria de León in Guanajuato, México. The popular Sosa (45-7, 27KO's) comes from a thrilling 12 rounds battle in which he defeated Wilbert “Huracán” Uicab to capture the WBC Silver Title. The fiery fight that took place last April in Cancún has been one of the best this year in Mexico. At 32 years of age, Sosa looks forward to make a good impression on defeating Ikehara to press for a world title fight against WBC regular flyweight champ, the newly crowned 28 year old Toshiyuki Igarashi (16-1-1, 10KOs). The Igarashi-Sosa match for the WBC flyweight title is the fight being planned. In order to fight world chmp Igarashi, Edgar Sosa must win tomorrow. Igarashi dethroned Filipino veteran Sonny Boy Jaro who was making his first title defense. Meanwhile, for the 30 year-old experienced challenger Shigetaka Ikehara (22-3-2, 18KO's), battling Edgar Sosa tomorrow in Mexico is his lifetime shot at fame. The Japanese Ikehara from Yokohama has faced good opposition in his almost 9 year career as a professional boxer. But never one of the stature of Edgar Sosa, one of the most popular flyweights come out of Mexico. Among the best know fighters Ikehara has faced are world rated Filipino Rocky Fuentes who knocked him out two years ago in Tokyo; former world champ Tomonobu Shimizu (draw) and Japanese flyweight champ Takuya Kogawa (Ikehara's last fight, a close unanimous decision lost in Tokyo).